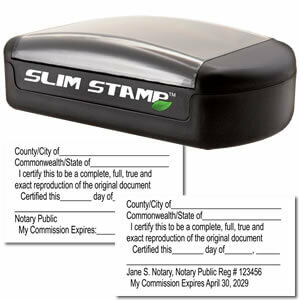 Slim Pre-Inked Official Notary Stamps were carefully designed for notaries that are on the go. Having to pack all of the necessary tools and stamps needed in order to notarize documents can be a chore. With our compact Slim Notary Stamps, just slide them in a purse, pocket or briefcase and you are ready to go! Pre-Inked stamps do not require replacement ink pads and are a practical and eco-friendly choice for Notary Stamps. Are you interested in this style of stamp but are hesitant if these Pre-Inked Slim Stamps will work for your needs? Contact us! We are happy to go over your individual needs and get you fixed up with the perfect supplies. 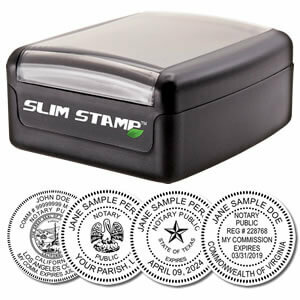 The Slim Official Round Notary Stamps work in an easy-to-use print and press manner. Geared for all hands no matter what size and slender in appearance. These pre-inked stamps are practical and hardworking for all notaries - whether your clients come to you or you are on the go. Guaranteed to leave a perfect impression every time and by all state boards, you are sure to enjoy this fun and inventive version of a traditional notary stamp. This Slim Official Rectangular Notary Stamp is a workhorse. Good for up to 10,000 impressions before re-inking is required, this stamp is sure to turn heads in the office. Eco-friendly in nature, this Pre-inked Rectangular Notary Stamp fits perfectly on to documents that leave little space left in the margins for a notary stamp or seal. Instead of writing out the required verbiage to confirm the recognition of the document by its signer every time, we offer this Slim Acknowledgement stamp. This Pre-Inked stamp packs a lot of text in to a portable and professional-looking stamp which makes it a must-have for all notaries. When your client is swearing under oath that the information on their document is true and correct, you will need to indicate that event on the document itself. This Slim Jurat Stamp allows you to simply press down and receive a clear impression of the correct text required to confirm the oath or affirmation. Hassle-free, mobile and professional - this is the stamp for you! As a notary, you may be expected to create and authenticate copies of official documents. The Slim Certified Copy Stamp is a great tool when notarizing a copy. Loaded with all of the designated text, this handy and petite stamp packs a strong punch and is a great aide to help keep you in compliance with state standards.